ways to improve your own home landscape. You will find some landscape design ideas showing the projects from start to finish. 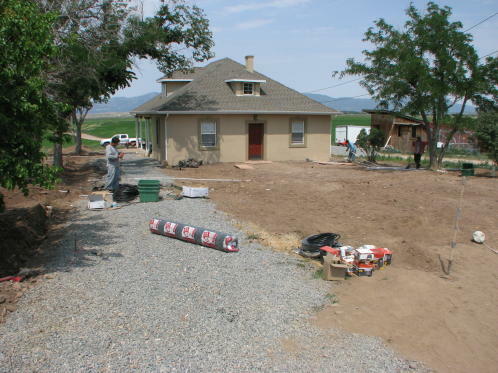 Your home landscape plan can be improved by using several of the ideas on this site. Of course, you know that everyone wants everything for free, including landscape designs, but you know it costs. one way or another. This site will show you many landscape design ideas and tricks of the trade that were learned from the school of hard knocks. There are many things that are common sense that you can do on your own to help reduce your costs. There will be several home landscape projects that I will show you the step by step process I used, as shown above in preparing to do borders. free-landscape-ideas will include home landscape plans and many photos of beautiful landscapes, including some that have been worked on personally. You will find tips of how to do the work yourself or perhaps, you may just want to hire the job done by a professional. Regardless, you will be getting plenty of free landscape ideas to help you make a yard you want to come home to. great ideas-for-landscaping-a-hill may be only for looks, but will probably be for erosion control. free-backyard-landscaping-ideas gives suggestions in planning your backyard design. landscaping-small-yards may include paver-patios and landscape-rocks, plus backyard flower garden beds. A rose garden can include many rose-types such as rose bushes, climbers, miniatures, and mini floras all determined by their structures, leafs and stems plus their colors size and stem. build-a-fire-pit in your paver patio, the flames will give you lots of entertainment. It's nice to relax around the fire pit at night after a hard days work. You can lay landscaping-borders around your lawn, flower gardens, pool or pond. When you use landscape-curbing, or edging, you add a finished quality to your landscaping. what-is-fertilizer? It is one of the most important things in raising plants, and more importantly is organic fertilizer. free-outdoor-lighting-ideas will enhance your property at night and act as security for your property. Using misters-systems in your landscaping can cool the area from 5 to 35 degrees. As a water feature, a wall-o-water adds a nice effect to your patio, court yard, or even indoors. desert-landscape-ideas apply to landscaping in the west and southwest U.S.A.